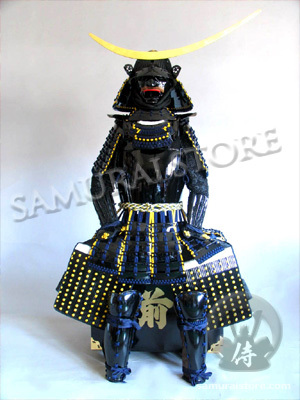 This Yoroi is the faithful reproduction of Date Masamune's most famous suit of armor featuring the large wooden crescent headerbord. This suit's body armor is constructed by hand, using multiple iron pieces, genuine leather, beautiful silk lacings and elaborately crafted chainmail. This Yoroi comes with all parts and accessories listed in the charts below, and can be worn, if desired.